Saddle Head (Gob Rua Corrach) is a spar that extends northwards from the north-facing cliffs of Croaghaun on Achill Island. This image was taken from the summit of Croaghaun, Achill's second highest peak at 668m and said to be the highest sea cliffs in Europe. The area immediately below this point is known as Gubfoheratawy. The lake visible on the right is Lough Bunnafreeva West, a remote and remarkable corrie lake situated some 350m above sea level. Click for another image of Bunnafreeva Lough West, Achill Island. 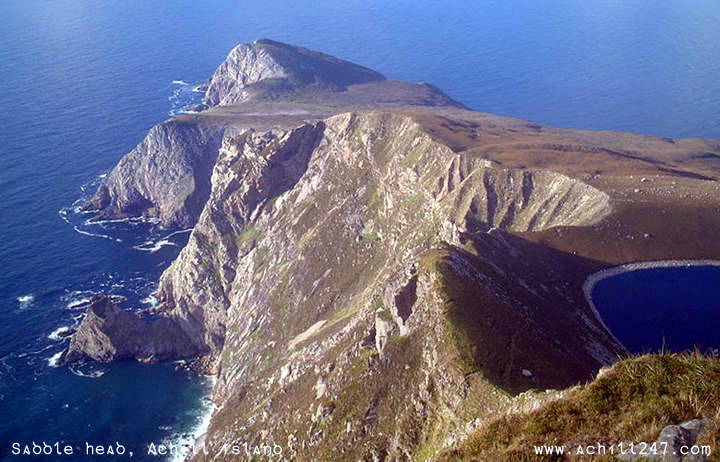 This remote area around the peak of Croaghaun is home to spectacular birds of prey, not the golden eagles from which Achill is thought to have been named (the last sighting of eagles on Achill was around 1900) but peregine falcons.